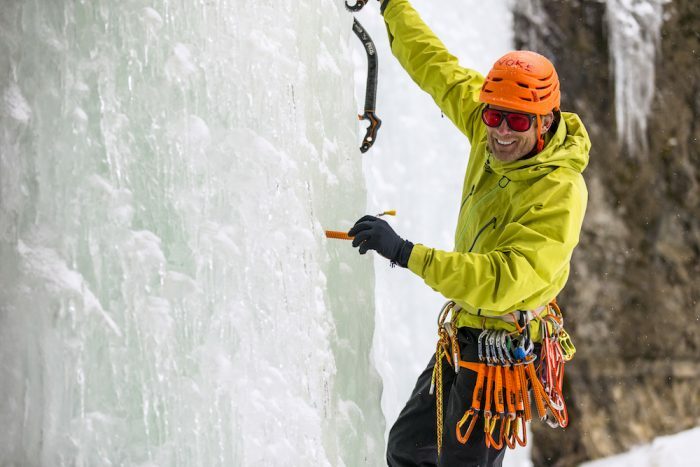 Conrad Anker’s legendary climbs and physical prowess belie painstaking planning, meticulous organization, and unparalleled gear knowledge. 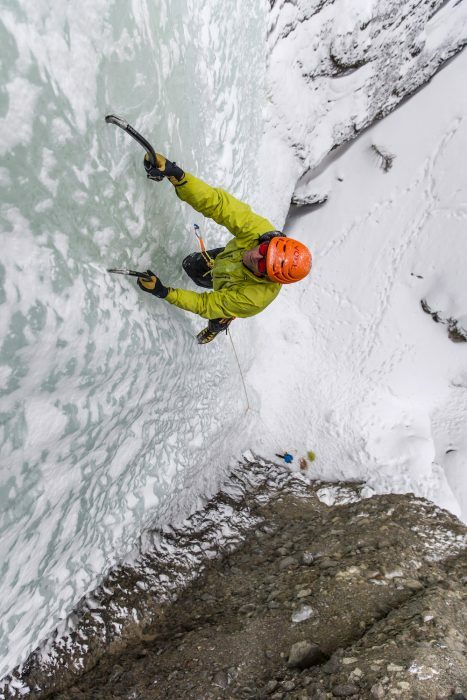 On Conrad Anker’s climbs, the menu can get monotonous. For 19 days, on the 20,700-foot Mount Meru in the Indian Himalaya, Anker, Jimmy Chin, and Renan Ozturk subsisted on oatmeal, energy bars, couscous with salami, and hard cheese every single night. In Meru, the 2015 film about the climb, the team cracks jokes about the all-couscous menu, but in reality they know from experience that Anker’s planning philosophy is sound. Facebook Founder Mark Zuckerberg follows Jobs’s wardrobe philosophy, and renowned author and physician Oliver Sacks ate the same breakfast every day of his life for the same reason. Making many small decisions can compromise your ability to make the big decisions well. It’s called “decision fatigue,” and in mountaineering it can have grave consequences. 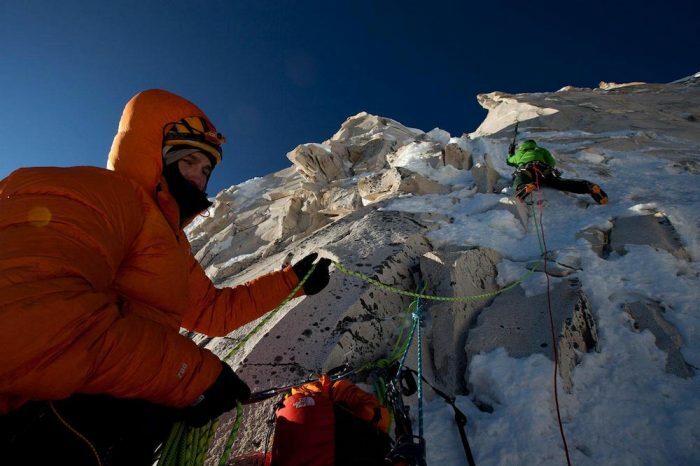 That the team lost 60 pounds between them on Meru (and failed to summit the route in 2008) had less to do with the Spartan diet than the storm that kept them on the wall for 12 days longer than they planned. Still, said Anker, their decision to go light and basic was the right plan, one of the hundreds of details that make or break the effort, and one that worked on their successful second expedition in 2011. “Concentrating on the details is what sets you up for success,” he said. Anker ought to know. He is arguably the most successful mountaineer climbing today, with more than 40 international expeditions on his resume and scores of first ascents to his name. 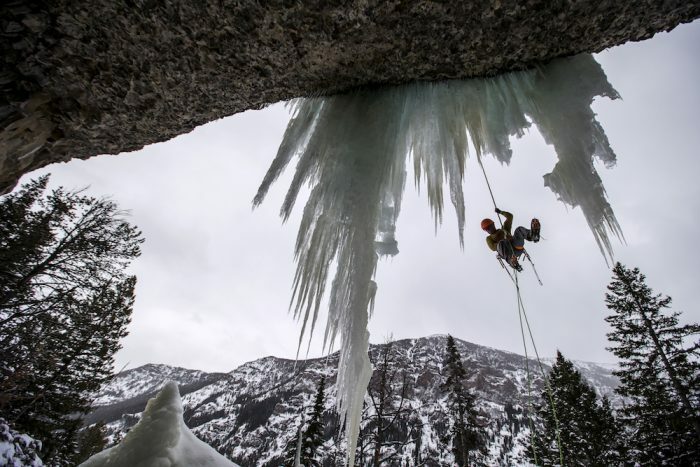 Even at 53 years old, he puts up four or five new routes each year, and in the last year became the face of climbing thanks to his starring role in Chin’s acclaimed Meru documentary. The story details Anker’s three attempts at the climb, and how he persevered in the face of losing two of his best friends and mentors. It cemented his reputation as a survivor, both professionally and personally. Amongst his peers, though, Anker is probably most celebrated as a meticulous preparer. 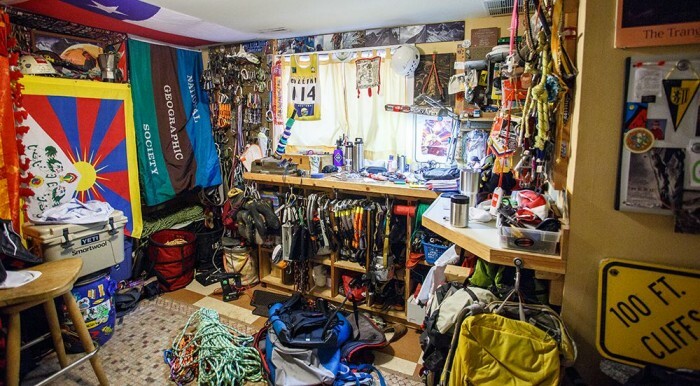 Nothing symbolizes Anker’s relationship to preparation like his gear room—probably the most celebrated man-cave in all of adventure sports. In October 2015, I met with him there as he began to organize his gear for an expedition to Nepal’s 22,621-foot Lunag-Ri. I observed his 6-foot-2-inch frame, lean and taut like a big cat, as he pulled a tent off a shelf and tossed it into one of a pair of plastic bins on the floor. The converted bedroom in the basement of his Bozeman, Mont., home has been the subject of a few short documentaries, and is as much museum as store room. There are racks of carabiners and cams, rows of ice tools, and shelves of tents. Spools of cord are slung below a workbench, and climbing shoes and boots are lined neatly in pairs. He gestures at the opposite wall, shelves crammed full of souvenirs from his 30 years of climbing—memories his gear helped create. There is a bottle of water from Gomukh, the primary source of the Ganges, high in the Himalaya. There is a rusted piton he pulled from the North Face of the Piz Badile in the Swiss Alps. A pacifier slung on a pink ribbon, which he brings on expeditions, “to remind people not to act like babies,” he said, grinning. 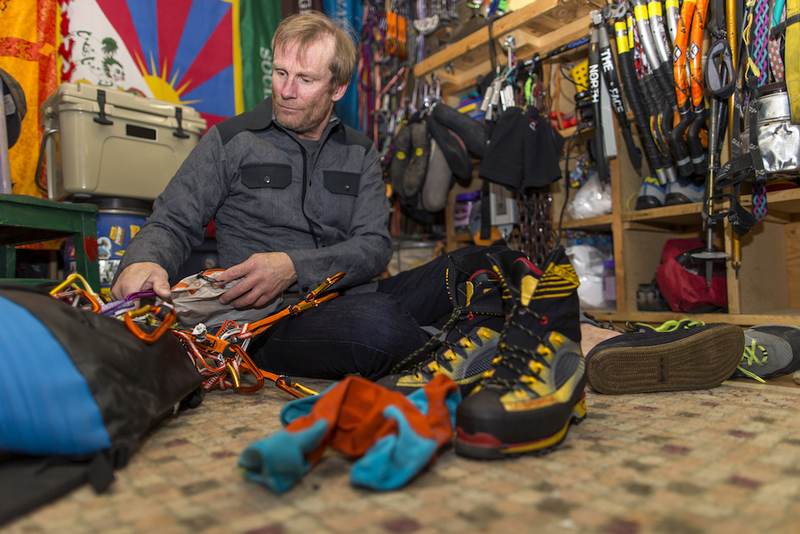 The gear room’s most poignant shelf is a shrine to his best friend and climbing partner Alex Lowe. In 1999, Anker and Lowe were attempting to ski the 26,335-foot Shishapangma in Tibet when Lowe and cameraman David Bridges were killed in an avalanche that swept over all three of them. Anker ran in a different direction and somehow escaped with only injuries, but was roiled by survivor’s guilt. In the months after Lowe’s death, Anker and Lowe’s widow Jenni, in their shared grief, grew close, fell in love, and married in 2001. Anker moved into the Lowe home in Bozeman—the same one where they still live today—and together they raised the three Lowe boys. In April of this year, the remains of Lowe and Bridge’s were found, 16 years after the accident. For Anker and the Lowe family, the news evoked mixed emotions. The shrine contains a dozen items, prayer flags, a signed climbing helmet, a pair of climbing tools, and a ’90s-vintage satellite phone. It’s a constant reminder of the risks Anker faces in his chosen profession, if Jenni and the boys aren’t already reminders enough. At one point Jenni came downstairs to check on a travel detail. Not that his work isn’t compelling. He’s in the inspiration business, after all. “I love climbing. It’s what I’m best at, and taking the risk out of life would be tremendously boring,” he said. The trick, then, is to manage that risk by managing the details ahead of time. For example, he only climbs clean, solid walls anymore. Not the crumbly, sedimentary rock that’s likely to peel off the wall and land on you. “Life’s too short to drink bad coffee or to climb crumbly sedimentary rock in the Himalaya,” he said. Anker famously remembers details of every major climb he’s done. 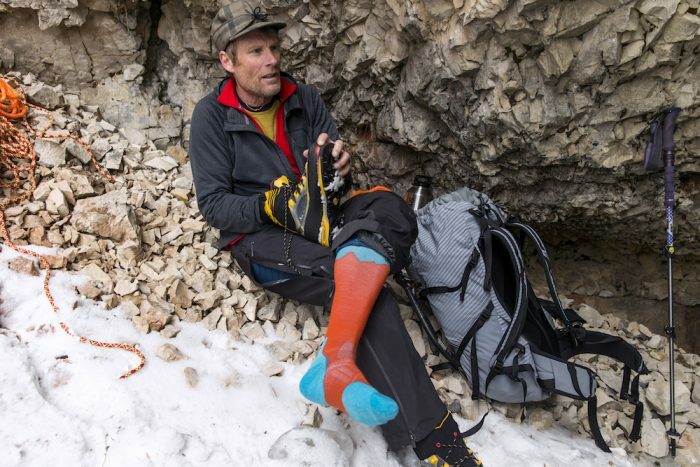 He maps the routes, move-by-move, in his collection of notebooks, and even copies out the route maps of climbs he hasn’t yet done in preparation. “It’s a memory trick,” he said. Anker approaches foot care with the same attention to detail. Every night, Anker carefully cleans his feet with soap and water, and scrubs between each toe. This is a real extravagance when crammed onto a hanging porta-ledge with two other exhausted people. He then rubs them carefully with salve before putting on a fresh pair of dry socks for bed. That care is what makes Anker a coveted gear ambassador as well. He has worked with The North Face on gear design for years, and is the visionary behind their heralded Ice Project pack. 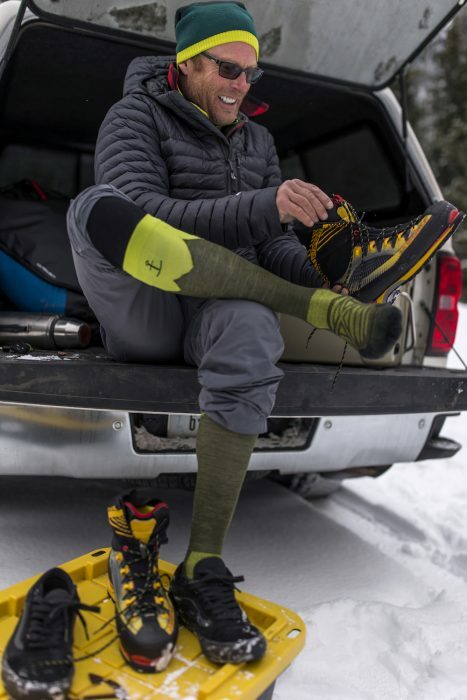 As a longtime Smartwool ambassador, he recently collaborated on the award-winning PhD Outdoor Mountaineer, a sock designed for the specific needs of alpine climbers. 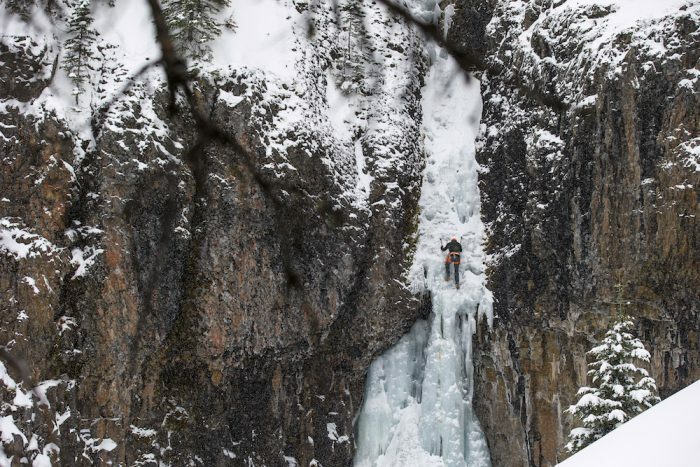 He and some fellow Smartwool athletes started discussing a new sock design around a fireplace in a small log cabin high in Montana’s Hyalite Canyon after a day of ice climbing in freezing weather. Anker took design ideas to Ramsey’s team at Smartwool’s design laboratory in Chattanooga, Tenn. There, they used cutting-edge computerized weaving machinery to build the complex sock with graduated compression, and toe and heel insulation that differ in thickness by degrees of millimeters. Anker sees his gear design as a sort of service to the climbing community—the fruit of his years of experience. His young climbing parters also benefit from the experience. Invariably, Anker selects the young hotshots from The North Face team, which he manages, as climbing partners. Chin was one such beneficiary before he became a star in his own right. Alex Honnold, 30, already famous for his free-soloing exploits, is another. Anker plans to get Honnold onto some alpine routes in the coming year to help him round out his climbing experience. Even if that means a monotonous diet and meticulous foot care. – This post was sponsored by Zappos. 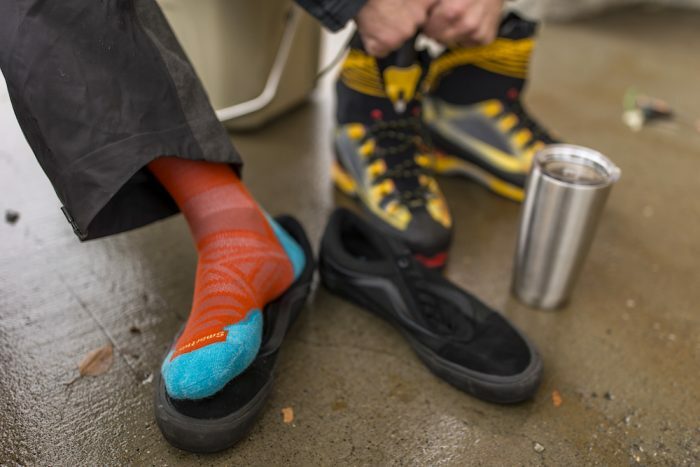 Check out the new Smartwool PhD Outdoor Mountaineer socks here. –Frederick Reimers is a freelance writer who grew up at Keewaydin Canoe Camp, a wilderness canoe-tripping youth camp in Temagami, Ontario, where his father was camp director. He was the editor of Canoe and Kayak magazine from 2007 to 2009 and writes for numerous outdoor and action-sports titles, including Outside, Skiing, Powder, and Men’s Journal.